VAUGHAN -The Kortright Centre for Conservation is Ontario’s premier environmental and renewable energy education and demonstration centre. Situated 10 minutes north of Toronto, on 325 hectares of pristine woodlands, Kortright Centre combines a natural oasis with some of the most leading edge sustainable education programs and events in Canada. The centre hosts 135,000 visitors annually and offers over 50 environmental education programs for schools and 30 sustainable technology workshops for the public, trades and professionals. 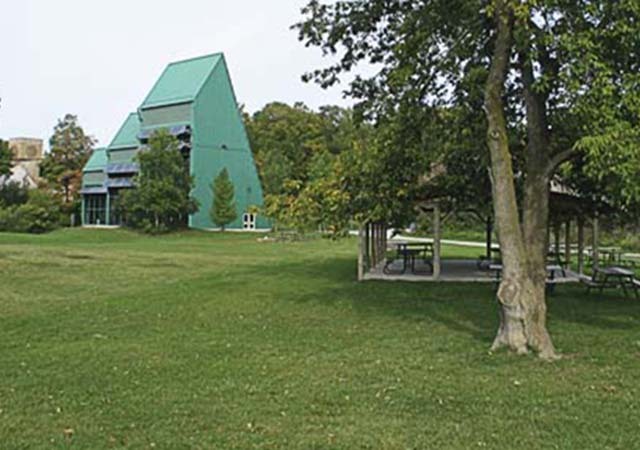 Since 1982, the Kortright Centre has been a centre of excellence in the field of sustainable technology. The sustainable technology education programs are anchored around The Power Trip Trail, a 1.6 kilometre trail which links a variety of demonstrations on renewable energy, energy efficiency, waste water treatment and sustainable building design. Come visit the Kortright Centre and enjoy the many kilometres of trails – excellent for hiking, cross-country skiing, and much more! The Kortright Centre for Conservation is located at 9550 Pine Valley Drive in Woodbridge. Pine Valley Drive is located south of Major Mackenzie Drive, west of Highway 400.